The Revo Intercooler upgrade for the Ford Focus RS Mk3 2.3 EcoBoost utilises unique design features to lower intake air temperatures, minimise pressure drop and allow the engine to produce impressive power and torque increases. The Focus's turbocharged 4-cylinder engine produces extreme intake temperatures that the standard intercooler struggles to cope with, especially after consecutive hard use. The Revo Intercooler combats this by directly replacing the OE part, enhancing cooling efficiency by over 40ºC, allowing you to drive harder, for longer. 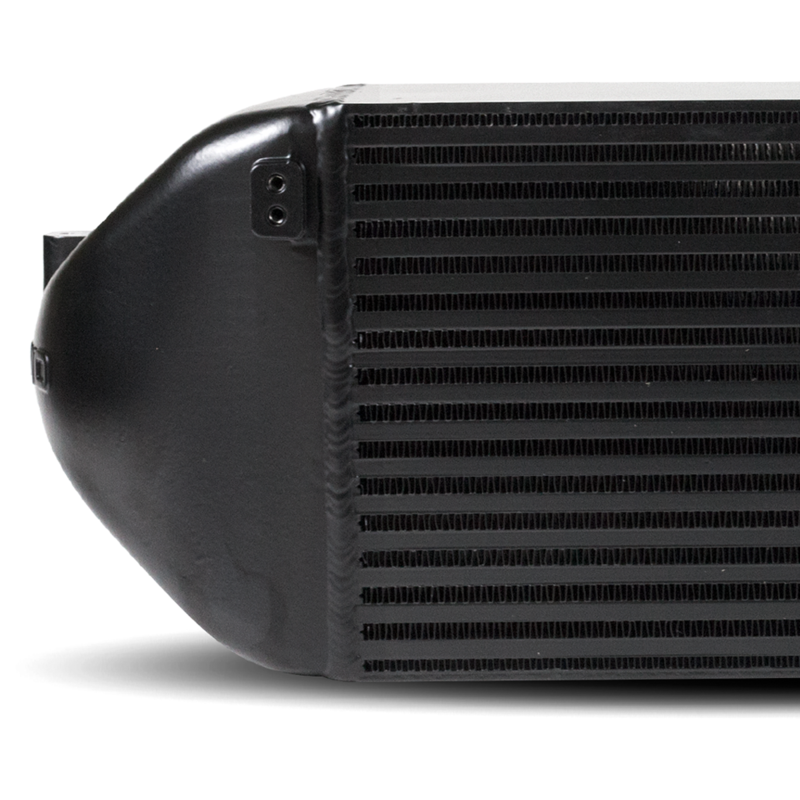 The Revo Intercooler was built around the simple principle of creating the largest amount of surface area possible to improve cooling efficiency. 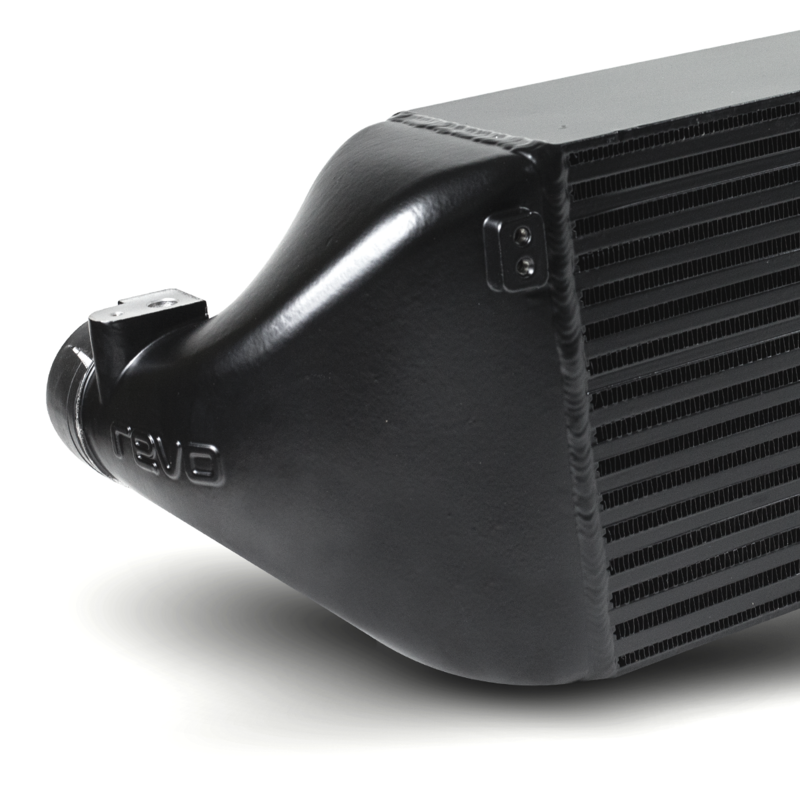 The Revo Intercooler for the Focus RS has been maximised to offer the largest possible external core volume with the stock location, improving cooling by utilising cold ambient air from the front of the vehicle. The Revo intercooler uses flow-conducive geometry lines to allow a fitment of the larger cooler, while still promoting the best possible flow within the end tank. The Revo Intercooler end tanks are precision cast to eliminate turbulence and ensure the maximum amount of air can reach the core. Smoother internals allows air to flow freely and are not obstructed by welds or inefficient construction found in the standard OE intercooler. End tanks play an important part in maintaining pressure and work in harmony with the core to promote air flow. Designed with a bar and plate core to guarantee the efficiency of heat transfer, this also minimises pressure drop as the air meets less resistance compared to that of a tube and fin alternative. 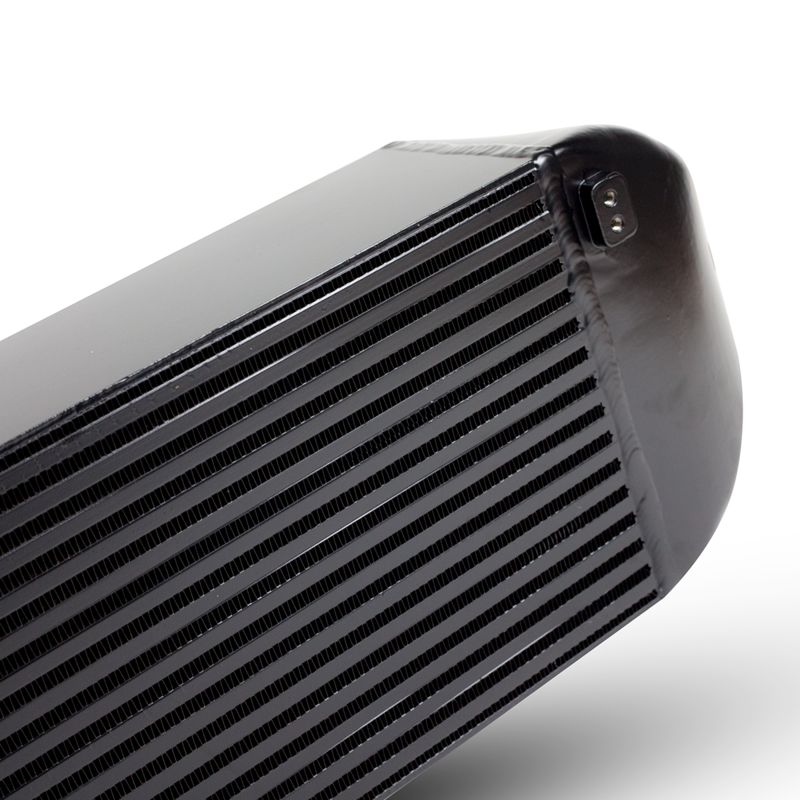 The Intercooler also features louvred fins to slow ambient air flow which improves heat transfer, along with an offset internal fin design to balance surface area and resistance to minimise pressure drop. The Revo Focus RS Intercooler was tested on an in-house, fitted on a stock car running Revo Stage 2 software and Milltek downpipe. Comparison runs where carried out with the stock intercooler vs the Revo intercooler. 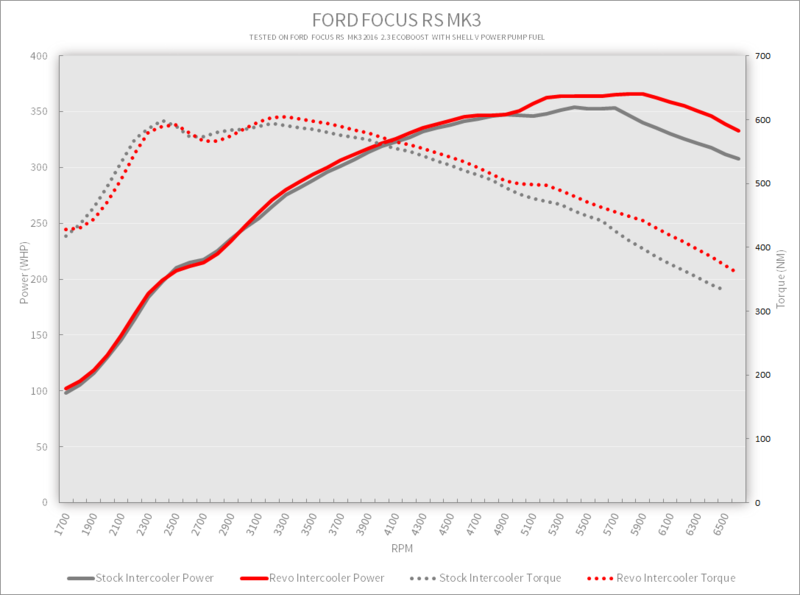 Showing the last of four consecutive dyno runs, the efficiency of the Revo Intercooler over the stock part is highlighted. 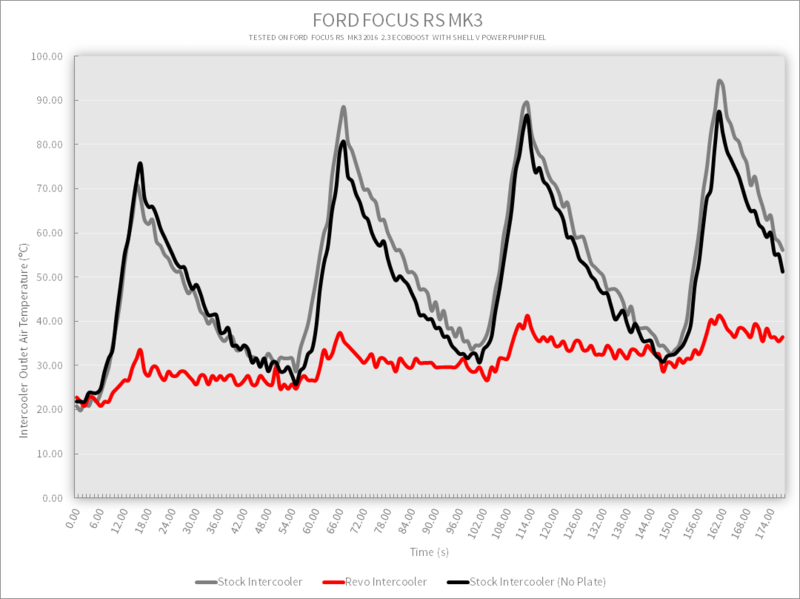 With peak gains in Torque, along with increased performance throughout the entire rev range, the stock intercooler struggles to effectively function in comparison to the Revo Intercooler which remained consistent throughout. 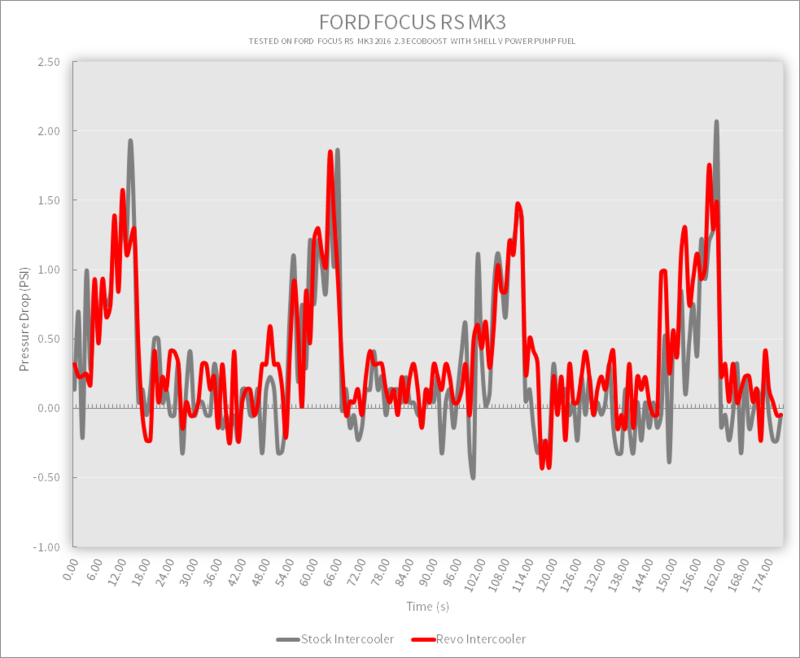 This graph illustrates the increased cooling performance of the Revo intercooler vs the stock cooler over all four runs. The Revo Intercooler keeps temperatures lower on its first run than the stock does on its first. It is also apparent that the ECU was pulling back timing over the 4 run of the stock cooler to control intake air temperatures.